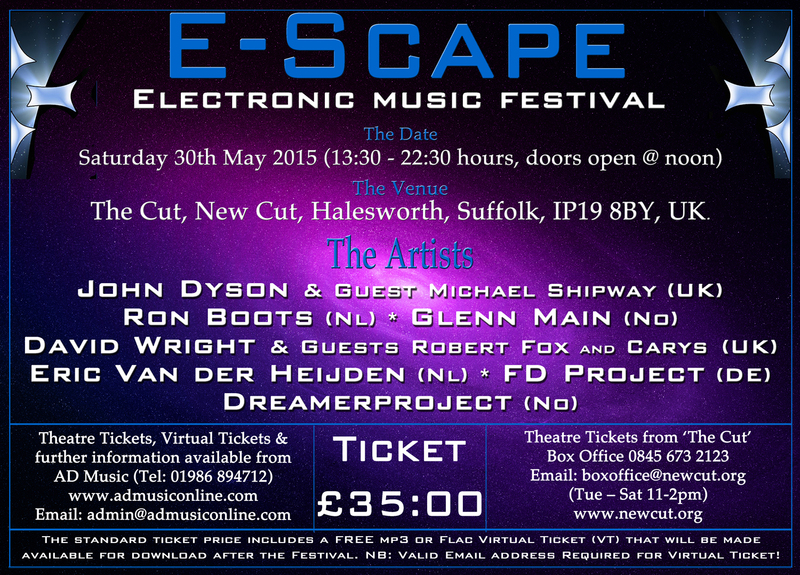 AD Music is pleased to announce the full line up for it new “E-Scape” festival on 30th May 2015. John Dyson with Guest Michael Shipway (UK); Ron Boots (NL); David Wright with Guests Robert Fox and Carys (UK): Glenn Main (NO): FD Project (DE); Eric van der Heijden (NL); Dreamerproject (NO): The last three mentioned acts playing their first UK solo concerts! E-Scape is an annual all day festival of live electronic and ambient music held at ‘The Cut Arts Centre’ in Halesworth, Suffolk. It is usually held at the end of May, beginning of June, the week after the bank holiday weekend. The event is hosted by UK record label AD Music to promote traditional electronic music from around the globe. It usually features AD Music artists but is not exclusive to the label and always includes non AD Music artists. It started as “The Bungay Bash” in 2009 and moved to Halesworth in 2015 as the newly named E-Scape. A unique selling point for the event, as of 2015, is that the ticket includes an audio ‘download’ of the event in high rate MP3 or Flac, available after the event. This means fans of the electronic music scene from around the world who are otherwise unable to attend can still hear the concert, albeit afterwards, and are also actively supporting their favourite artists and the electronic music scene by so doing. Theatre Tickets and Virtual Tickets are now available from the AD Music web site, price £35:00 and tickets will be sent by email. We are not posting tickets unless specifically requested to do so and standard 1st class postal rates will be added. ~ by admusic on October 8, 2014.